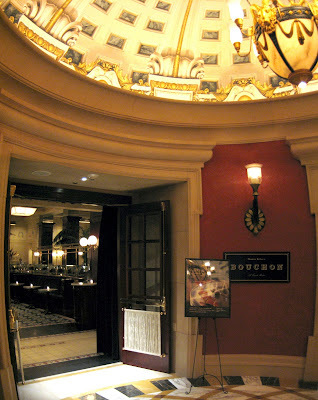 Thanks for the excellent review...will try Bouchon on our next visit to LV. If you are still in Vegas, do make the time to visit Rosemary's. I would love to read your review on it! That is one of the first restaurants I found on chowhound. We enjoyed it very much, esp. the half price wine nights on Sunday and ladies night on Wednesdays! Thanks for the great details, I ate at Bouchon last year, scallops for dinner, and the lightest most decadent waffles for breakfast, it was excellent! 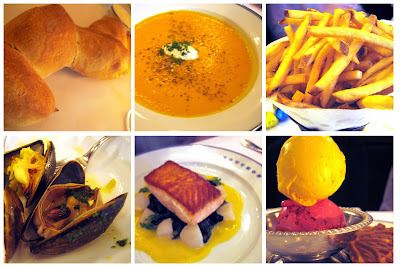 Bouchon has always been on my list of places to try in Vegas, but I've yet to have the pleasure of eating there. I agree with you on L.O.S. though, it is so far, the best meal I've had in Vegas. Did you eat there too on this trip? So fancy! Those prices aren't that bad at all. Well, still out of my budget for now but when you think some overpriced chain restaurants charge that much anyway. I'm more of a Vegas for the cheap buffets (indulging in Bellagio's only). I'm so happy that you finally ate at Bouchon LV. I took my girlfriend there for a wonderful meal about 6 months ago when we were in town. I was too inspired to try the fries from Tony Bourdain's No Reservations and he wasn't exaggerating. Amazing how something so ordinary such as french fries could be so refreshingly recieved by my palate. I had the Steak Frite, my girl the Poulet Roti. They both were excellent. We finished off with the Creme Glacee/Sourbet de Fruits and it was the absolute perfect ending to a wonderful experience. The service was impeccable, it didn't feel like the servers were just playing the role, they were very knowledgable and freindly, especially with their wine recommendations. I too enjoyed how it wasn't pretentious, it almost felt like a restaurant you'd see in Paris, especially with the lighting and the simple wooden bar area. I cannot wait to return to Vegas so that I can dine there again. That food looks so good; I envy you for being able to have such a magnificent feast. While you were at the Venetian, did you ever get the chance to see Phantom? It's an amzing prodduction, and I don't even like musicals. Brilliant review. You stepped up on this one. Actually this visit was about two weeks ago, so I'm already back in OC. Will have to keep Rosemary's in mind the next time! Thanks! Hadn't realized they do breakfast! Wow! That would've been a treat: to come down the elevator and have breakfast at Bouchon. Oh you bet we were at L.O.S. That was our first stop on this two night trip. We only did one trip there this time, but usually it's two, or three! It's pretty reasonable for a restaurant of this caliber actually. If this were France (as I'm sure you'd know), food like this is an everyday occurence in bistros, like burgers and fries in diners. Thanks for posting about your own Bouchon experience! This post is long overdue, and is actually my second time there. The first was about exactly one year ago, but the food pictures then came out horribly. I was just impressed then as I was this time. And I am sure when I go next year, it'll be just the same. One of the best french fries I've ever eaten! Of course, I didn't say Belgian Fries. That's another beast entirely. Didn't catch Phantom, but we did see Le Reve, which was alright. Phantom would've been a great show to see. I saw them building the theater last year, and it looked spectacular! Thanks dude! That's a great compliment that you think so. Link didn't work. Just google Bouchon and frozen fries. I deleted your comment with the link since it wasn't working and also causing formatting problems (damn Blogger template). Thanks for this Anon! Quite an eye opener! I'm surprised, but I don't know if I can say I'm disappointed, because they were still really, really great french fries (the best I've had so far), and at no time did they tell me it wasn't from frozen. I just made that assumption, because, c'mon...it's Thomas Keller! I've never really had a desire to go to Vegas before, but this review is making me rethink that. My mom and her life partner will be going there soon. I'll pass on this recommendation to them. Oh gosh. You're not even 21 yet!? Anyway, french toast bread pudding?! My that sounds awesome in so many ways. I need to try it next time, for sure! With LOS, and Bouchon, Vegas has totally become a dining destination for us. To me, the casino floor is just an obstacle to get me to the good food. After reading about those mussels, I now know why it is called "Sin City." Gosh, the description of those mussels had me gulping for more! More sin please Elmo! Gluttony: a sin we can all agree on! hmm... I actually disagree with you on this one. I went with 15 of my friends during New Year's Eve and Bouchon was our backup restaurant since the one we were going to was overbooked. hey elmo, i've eaten at the bouchon in yountvilla/napa and also the vegas location. i agree with you on keller's liking for vegas. in fact, i love that it's tucked away and hidden from the fanny-pack/hawaiian shirt wearing tourists. both restaurants are beautiful. i've only had the fries at the yountville location and like them too. i tried the seafood plate at the vegas location and loved the oysters - everything else was so so. overall, i would still come back here. nice posting as always. It's always great to hear an opposing opinion. As the previous poster mentioned about the fries being from frozen, it makes for a balanced perspective on the restaurant. On this second trip, everything was amazing. On the first one last year, we tried the chicken, and it tasted like...well chicken. I guess there's only so much Thomas Keller can do. Everything from what I've heard, including people I really respect, Bouchon in Vegas isn't that great especially for those prices. It may have started out strong, but there's been too much turnover and the food has really suffered in the past couple years.